Welcome and thank you for your interest in becoming a member of the Brooklyn Chamber of Commerce. 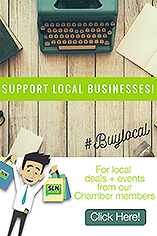 The Chamber serves the businesses and residents of Brooklyn and its surrounding communities. As owners and managers we need to take advantage of every opportunity to improve and grow our business. Being a member of the Chamber provides you with some of those opportunities. To start receiving the many benefits of being a Chamber member, fill out the application below. Feel free to contact us at asstdir@brooklynohiochamber.org or 216-288-5484 with any questions. An Application Fee of $30 will be added to your first year's Annual or Founding dues for clerical processing and your membership plaque. Each member is entitled to 1 to 3 representatives depending on the classification and number of employees. Additional representatives can be added (up to a total of 3) at a cost of $55 per year per additional representative. What is the sum of 7 plus 5?